External view of the church, from the church path which leads south-east. The Castle (2, 3) is at about 90 degrees to the left of where the picture was taken. 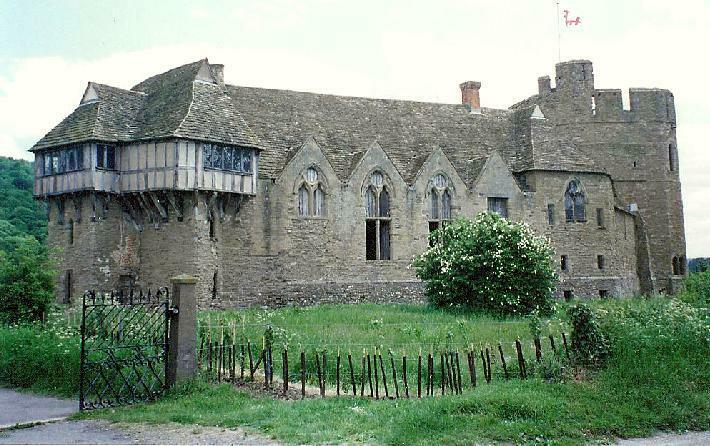 3 - 5 Stokesay Castle, a fortified Manor House. Pictures 4 & 5 are reproduced from that web site with consent from Jeffrey L. Thomas. 6 The nave looking into the chancel (really only a continuation of the nave), with the canopied pew on the left (north) and the two-decker pulpit on the right (south). 8 The two canopied pews. 9 & 10 The West Gallery, and the staircase leading to it. Under the stairs are the five pews which survived the Civil War. At the north side of the gallery there is a space for musicians The band comprised a bass viol, flute and clarinet, and was replaced about 1855 by a harmonium, and later still by the present organ. 11 The Ten Commandments written in a panel on the wall, very visible from the west gallery. The church was built about 1150 as a chapel to the castle by the Say family who had come over with William the Conqueror. The Says came here about 1105 via Clun. The 'Stoke' part of the place-name means a 'dependent settlement' or a 'dairy farm' and implies a fenced off area. In 1646 a Royalist party with their horses took refuge in the church, but they were driven out by Parliamentarians who had captured the castle. Much of the church was destroyed in the battle: the south side of the nave, facing the castle, was destroyed entirely, probably by canon shot. The north side was not damaged so severely: here the jambs run half-way up the single-light windows, showing that up to this height the wall probably survived the Civil War bombardment. The oak door, with its massive lock and key, date from 1654. The Nave of the church is a rare act of church building in Puritan times. Its date (1654) can just be seen on the tablet at the head of the tower arch. The walls of the church display several attempts at decoration in a devotional manner. The Ten Commandments are painted on the north wall with figures representing Moses and Aaron on either side. The central square would originally have been for the Royal Arms. All the texts and the Lord's Prayer were brought to light about 1870 when the walls were scraped prior to re-colour washing. In 1988-89 expert help was obtained to conserve them. The chancel was restored in 1664, as may be seen by the date on the eastern side of the supporting beam. The arms of the Baldwyn family , who occupied the castle at the time, can be seen on the corbels. At one time a panelled oak screen was attached to this beam, but was taken down to make room for the choir stalls about 1900. Stokesay is first heard of in the period immediately after the Norman Conquest. Roger Montgomery was created Earl of Shrewsbury by William the Conqueror, the land being granted to him including the Manor of Stokesay. Roger Montgomery, in turn, granted this Manor to one of his retainers, Roger de Lacy. The Say family were the tenants of the Manor until the death of Walter de Lacy in 1240, when his son-in-law John de Verdon inherited the title and obtained possession of the Manor from Hugh de Say by exchanging land with him in Ireland. The north tower and parts of the solar block may be the work of John de Verdon as the building of the present Manor house dates from about this time. Verdon's tenant, John de Grey, sold the tenancy of Stokesay to the merchant Lawrence of Ludlow in 1281. We can assume Lawrence continued with the building soon after 1281, while completion, or approaching completion, of his work is perhaps indicated by the 'licence to crenellate' which he obtained in 1291 from Edward I at Hereford. The gallery at the west end is thought to be 17th century, and was until about 1855 the place used by musicians and 'songsters' (to quote the Church Guide). After that an organ was installed and occupied a space on the north side of the church, between the canopied pews and the sanctuary. The present organ . . . brought music back to the gallery when it was installed there in 1967. Under the gallery are five primitive pews which escaped destruction in the Civil War. The ledges are for feet, not books! The box or canopied pews in the chancel are finely carved, but not exactly designed for worship. The principle families in the parish would have used them, after entering the church through what is now a blocked up doorway in the wall opposite. These pews, like the pulpit, date from 1664-65. The pulpit was originally a three-decker, but was modified in 1900. In 1987, however, the Reading Pew was restored to a two-decker with fixed seal and steps with side panel. Stokesay, Salop, S John Bapt (GF), 6, 9cwt in A flat.